How do I book the lessons? Only the online booking is tied to a 15% discount on all types of lessons. 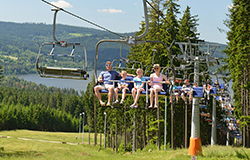 You will pay the reservation after you arrive in Lipno, until then you can cancel or change it free of charge. By phone at 00420 731 410 812 from Monday to Sunday from 8:15 to 17:00. Telephone reservations are only possible if you can no longer book online (less than 2 calendar days before the start of the course). 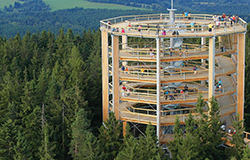 You will pay the reservation after you arrive in Lipno, until then you can cancel or change it free of charge. Personally, at the ski school counter. We are located in red building “Restaurace lanovka” right next to the main parking lot. Use the entrance through Intersport shop. We are here for you daily from 8:15 a.m. to 5:00 p.m.
What is better? Group or private lessons? Both options have their pros and cons. The advantage of the individual lessons is absolute utilization of the time and the maximal contact with the instructor. The advantage of group lessons is the teamwork, demonstration of the techniques on other participants, possibility of games, engaging in competition and trying to be as good as the others. However, it is necessary to consider the character of the child; for some children a group is motivating, while for others it is stressful. In what language will be taught? We have Czech-, German- or English-speaking instructors, who also know the basic commands in Dutch. The language of the lesson is not guaranteed. However, we always try to assign the right instructor. You can specify the preferred language of the lesson in a comment field during online reservation. The free ski passes are included in the price of each private and family lesson for the duration of the lesson. For skiing before and after the lesson you need to buy the ski pass. Ski pass for group lessons must be purchased separately. We will inform you about the need for a ski pass for group lessons during the sale of the lessons or the instructor will let you know when the ski pass must be bought. How do I know the level of skiing or snowboarding? Each age category is divided into four skill levels that are taken into account when distributing children to groups or selecting the right instructor. For a specific division, see the riding skill level table. What should the children take along? Ski/Snowboard, ski/SNB boots, and helmet (unless you rent them on site), warm waterproof clothing, adapted to the current weather, spare gloves, scarf, hat or balaclava under the helmet, facial tissue pack, ski diary from previous lessons. In case of small children, the average is 4 – 5 children per one instructor. For older children that are complete beginners, it is approximately 6, and for more advanced children the average is 8. To ensure safety and effectiveness of the lessons, 2 groups are usually joined at the beginning. When do the group lessons start? The group lessons start on Sunday or Monday and the minimal duration of the lessons is 3 days. In the middle of the week it is not possible to start with the group lesson. Can siblings be in the same group? Group lessons are the most beneficial for participating children if all of their members are on the same ski level. The pace of the ride, the chosen terrain, and the elements to be presented are selected to suit all members of the group and move them to a higher skiing level. However, if there is a weaker member in the group, the instructor must adapt the lesson to this person. On the contrary, if someone in the group is significantly better, the lesson may not move him/her anywhere. Inclusion of siblings in one group is only possible if they are in the same age category and their skiing level is the same. We distinguish BABY (4-5 years) and KIDS (6-15 year old). Is the helmet obligatory during the lesson? The helmet is obligatory for children under the age of 15. We also recommend it to everyone else for safety reasons. Poles are not used for beginners and slightly advanced skiers at all. In case of advanced skiers, it is up to the instructor to decide when to start using the poles during the lessons. If you are not sure, take the poles for the meeting with the instructor with you and talk to him/her if they will be need for the lesson. Is it good when parents are nearby during the lessons? No, it usually distracts the children. We recommend you to pass the children to the instructor and leave or watch the lessons from a distance. Are the lessons limited by age? The lessons are limited only by the minimum age. Private skiing lessons can be attended by children from the age of 3 years, group lessons by children from the age of 4 years. We provide snowboard lessons for children from the age 6 years. Is the vest obligatory for my child? All children under the age of 15 are obliged to wear a special reflective vest of the ski school. You can pick up the vest at the counter of the Skischool Lipno when you pay for the lessons. Children over 15 years of age and adults must be marked with a reflective band during the lessons; the instructor will lend them the band for the duration of the lessons. What purpose does a ski diary serve and does my child have to have it during the lessons? The ski diary serves to record the skiing skills that a child has gained during the lessons. We recommend having the ski diary for each lesson so that the instructor knows what has been explained already and so that the instructor is able to follow in the previous lesson. For children, the diary is something like a certificate and it motivates them to continually improve. Do I have to pay immediately for the booking made through your booking system? No, you will pay for the booking at the counter of the ski school. The payment in advance is not possible. If you can’t participate in the lessons for any reason, please inform us as soon as possible over the phone (8:15-17:00) or anytime via SMS or email. We will cancel or change your booking anytime free of charge. How much in advance should I make the booking? Generally speaking, the sooner the better. Especially during weekends and holidays the demand is large and the capacity of the school may be full many days in advance. At the same time, the on-line system won’t allow you to make the booking for any sooner date than 2 calendar days ahead. Can I book a particular instructor? Yes, if the instructor is available for the chosen date, you can book him / her. The guarantee service for a particular instructor is subject to a fee in the amount of 10 % from the basic selling price. If I cancel the already paid lesson in time, will you refund the payment to me? If you cancel your paid lesson more than 12 hours before the start of the lesson, we will refund the entire amount of the payment. If you cancel your paid lesson later than 12 hours before the start of the lesson, you will be charged a handling fee in the amount of CZK 300. In case of injury or illness, you will be refunded the amount for the unused lessons upon presenting your medical report. Why do I need to pay for all my bookings at the same time? This is for the reason of effective planning of the distribution of the lessons among the instructors. We try to make sure that the instructors are busy equally and in the most efficient way, so that each client is ideally taught by the same instructor best suited to his/her age and skiing level. In the past, we have had poor experience with clients who made several bookings, and neither came to pay for the lesson nor cancelled the lessons. Such bookings unnecessarily utilized the capacity of the ski school and blocked the appropriate instructors for other clients. In case you do not want to continue with the lessons, it is enough to cancel the lesson and we will refund your money back to you. 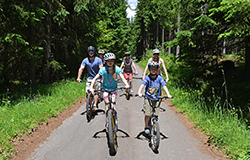 Why am I going to lose the discount upon changing my on-line booking at the counter of the Skischool Lipno? The bookings created online are allocated to instructors in advance. In case of timely booking, we try to have the same instructor for all your lessons, making sure the instructor is suitable for your age and skiing level. If you decide to change anything at the last minute, the booking must be cancelled, modified, or move, which means making the same administrative steps as when the client comes to buy the lesson at the counter without prior booking. The online booking then loses its advantage.